In May 2019, Bon Appétit Management Company will begin removing plastic straws in all of their 1,000 cafes in 33 states. By October, their plastic straws are expected to be eliminated for general use but available to those with disabilities that make using a straw to drink necessary. 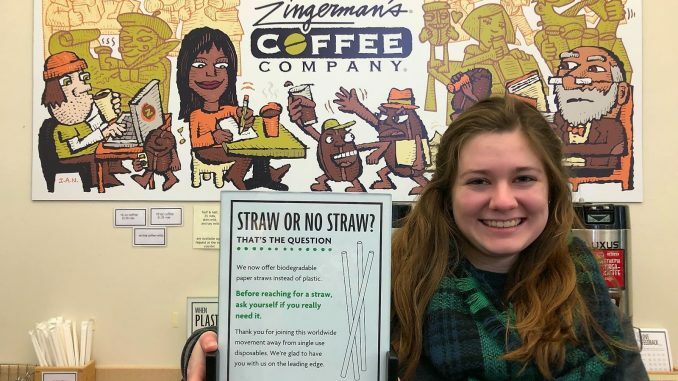 According to Patricia Miller, associate director of Bon Appétit’s dining and hospitality services at Albion College, over 85,000 straws were used on campus this past year. If the removal is successful, Bon Appétit Management Company will be the first food service company to entirely ban plastic straws. They hope it will help the environment. Not all plastic straws are accepted by recycling centers because they can be too small and thin for recycling machinery to pick up — think of the way sand falls through the gaps between fingers as one tries to pick up a handful of it. Many are thrown away. In a paper published by Science Magazine, researchers concluded that of the 8.3 billion metric tons of plastic produced to date, only 9 percent is recycled. Eight million metric tons are found across coastlines. The rest remains in waterways and gutters and takes more than 400 hundred years to degrade or is incinerated. Australian scientists Denise Hardesty and Chris Wilcox estimated that plastic straws contribute to 4 percent of the total amount of plastics in the United States. Although it’s a small percentage, Bon Appétit Management Company’s goal in the plastic straw ban is to educate people on how all plastics affect the environment. According to the Center for Biological Diversity, plastics have a direct and lethal effect on over 700 marine species, like Hawaiian monk seals and Pacific loggerhead sea turtles. Some species ingest it, others get entangled in it. In either case, plastic can be lethal. While plastic straws will be eliminated from cafes, not all straws will be banned. Biodegradable paper straws will be available. The word “ban” typically has a negative connotation to a person’s freedom, said Miller. Bon Appétit Management Company intends to use the word “ban” to bring awareness to the environmental impact plastic creates, especially straws. Sophomore Eryn Star of Centerbrook, Connecticut, is the president of Diversability, a new student group on campus that seeks to educate and advocate for persons with disabilities on campus in an intersectional manner. She said plastic straws are necessary for some. There may be different alternatives for straw use, such as bamboo, metal and biodegradable materials. Star said plastic straws are less of a choking hazard, less of an injury risk, cheaper, resistant to higher temperatures of drink and are easily positionable. “We’re not saying that plastic is good for the environment, we’re saying that the alternative materials for straws are less accessible to us, and the only accessible straw in the world right now for a lot of disabled folkes is plastic,” said Star. Albion College has not collected data on the number of students who may need straws because of a disability. Star said this is because having a disability is perceived as a medical problem, which colleges do not collect information on. Based on the United States Census Bureau in 2017, one in five people have a disability. That’s approximately 57 million people. “The plastic straw ban has left a lot of folks with disability to choose between their disability and being an environmentalist,” said Star. Albion’s Bon Appétit team said they will create signs near its plastic straws that say the utensils are reserved for people with disabilities that hinder drinking. The posters will also include information on plastic’s effects to lead consumers to ponder their use of other plastics, such as bowl lids, coffee lids and utensils. It’s inevitable that a student without a disability might grab a plastic straw, but Bon Appétit staff will trust the students’ integrites. Miller said they will not ask students proof of their disability. “There are disabled folks who have said, ‘I need a plastic straw’ after the ban took effect and the restaurant [employees] would ask what their disability was and ask them to prove it, which shouldn’t happen,” said Star. “Denying access and service to a disabled person is illegal under the Americans with Disability Act,” said Eryn Star. The Americans with Disabilities Act (ADA) of 1990 protects the civil rights of Americans with disabilities. No mentally or physically disabled individual may be discriminated against because of their disability. It also requires accessibility accommodations in public spaces. If a consumer wants to use a straw, they have the choice to use a biodegradable paper straw, which will be available beside the plastic straws reserved for consumers with disabilities. I am curious about developing paper / cellulose straws for one-time use. They could be sourced from sustainable material and would decompose naturally. (It’s what we used before plastics).